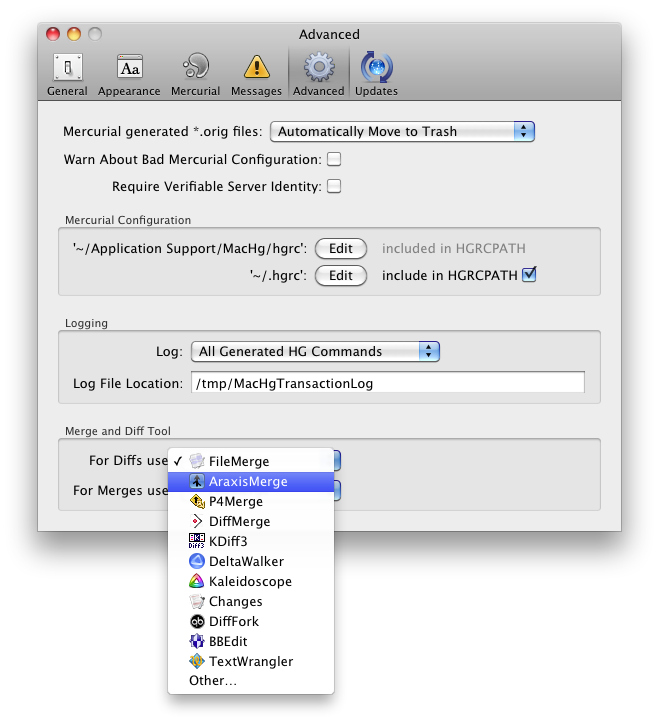 However, in making the changes in MacHg 0.9.17 so that everyone would get the latest enhancements to the diffing and merging tools as well as the speedup for the extension handling in Mercurial I choose to upgrade the support folder for MacHg. MacHg would detect when run if the most advanced version previously run was before 0.9.17 and if so it moved ~/Library/Application Support/MacHg to the trash and of course just regenerated this folder. This worked fine for me, but it turns out that I made a decision (a bad one), way back at the start, to store the default location of the repository list in ~/Library/Application Support/MacHg/Repositories.mchg. So for users who just used the defaults, I had moved their list of repositories to the trash. ! !Opps… Not good!! Anyway MacHg 0.9.18 fixes this by moving only ~/Library/Application Support/MacHg/hgrc to the trash. In a future update I’ll make sure Repositories.mchg is handled either in the documents folder or in a better way. MacHg 0.9.19 is also a small point fix to make the amend option to commits work again for those people who don’t have the mercurial queues extension turned on by default.